In part one of this miniseries, I introduced the basic concepts that underpin Kubernetes. I then provide a step-by-step guide that shows you how to get Kubernetes running on your local machine with Minikube, and how to configure and start a simple three-node CrateDB cluster on top of Kubernetes. To simplify the initial setup, the configuration I provided uses volatile storage (i.e., RAM) for retaining database state. Which is okay for a first-run, but ideally, we want our test data to be able to survive a power cycle. In this post, I address this shortcoming by showing you how to configure persistent (i.e., non-volatile) storage. I then show you to scale your CrateDB cluster. If you followed the instructions in part one, you should have a working Kubernetes configuration in place. However, if some time has passed since you did that, there is a good chance that Minikube is no longer running. No need to fret! It's straightforward to get things going again. Like last time, we're interested in port 32406, because this is the port that Kubernetes tells us has been mapped to 4200. 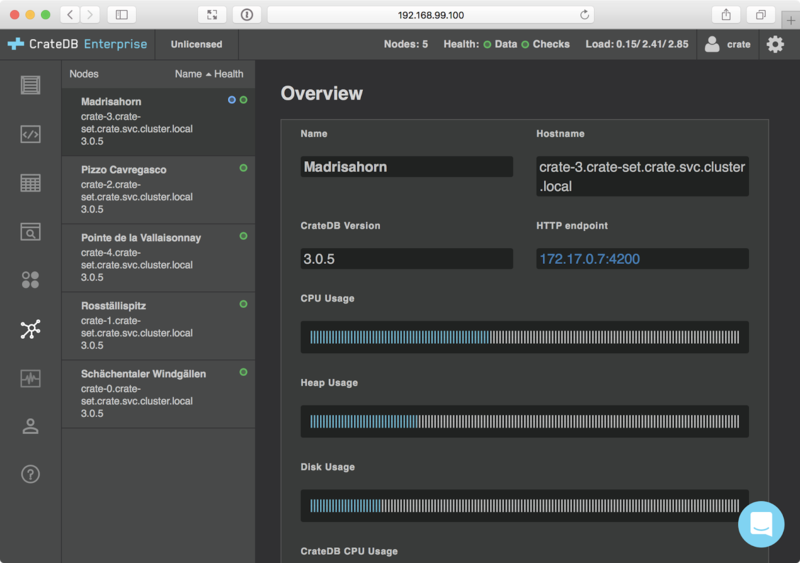 Port 4200 is what CrateDB uses for the HTTP API as well as the Admin UI. From this, you can fish out the address to use to access the Admin UI by matching it up with the port number we're interested in from the previous command output. In this example, we're interested in 92.168.99.100:32406, but your address is probably different. Now, let's make some changes! # not be used for production setups! We're not setting up a production cluster, but it would still be nice to retain our test data between power cycles. So let's improve this by moving away from RAM. To create storage that persists to disk, we need to use a persistent volume. We can do this with a persistent volume claim. As the name suggests, a persistent volume claim instructs Kubernetes to request some storage from the underlying infrastructure. Kubernetes is agnostic as to the implementation details. You can choose a different volume size if you want. We cannot update the existing pods with this new configuration, because we are changing their storage devices. So when you make this change, you will lose any data you have already written to CrateDB. As you can see, we now have three 1GB persistent storage volumes. Each volume is bound to a specific pod. In the next two sections, I will show you how to scale CrateDB. Before you continue, it might be a good idea to import some test data so that you can see how CrateDB handles things as the size of the cluster is changed. 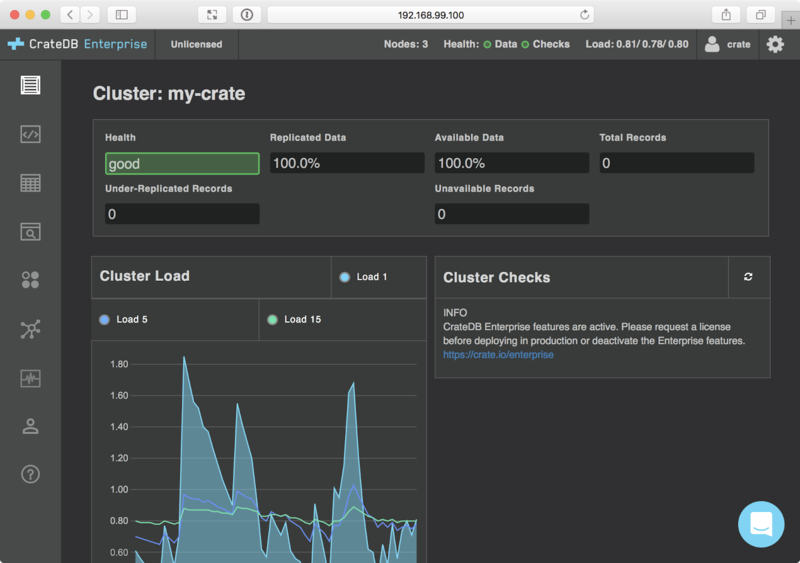 One of the benefits of running CrateDB on a container orchestrator like Kubernetes is the ease with which you can scale a cluster out and in to suit your requirements. The way that scaling works with Kubernetes is that you increase or decrease the configured number of replicas. Let's scale this out to five. You can change the number of replicas while the cluster is running. This might be useful to address a load spike quickly. However, that's not ideal for a permanent change, and CrateDB will warn you about this via the Admin UI. So, open the crate-controller.yaml file again. # Our cluster has five nodes. Now we have to update the CrateDB configuration to match. Both minimum_master_nodes and recover_after_nodes should be at least half the cluster size plus one. This time, because we're only changing replicas and the containers section, we can update our controller configuration in place. As before, you can monitor the progress of this scaling action with the kubectl command. You will see that Kubernetes terminates your already running pods one by one. No need to fret. Kubernetes has to terminate them to update the configuration. When Kubernetes starts them again, they retain their identity and storage. Congratulations! Now you have a five node cluster. Let's scale the cluster back in by one node so that we can see how CrateDB handles this sort of operation. 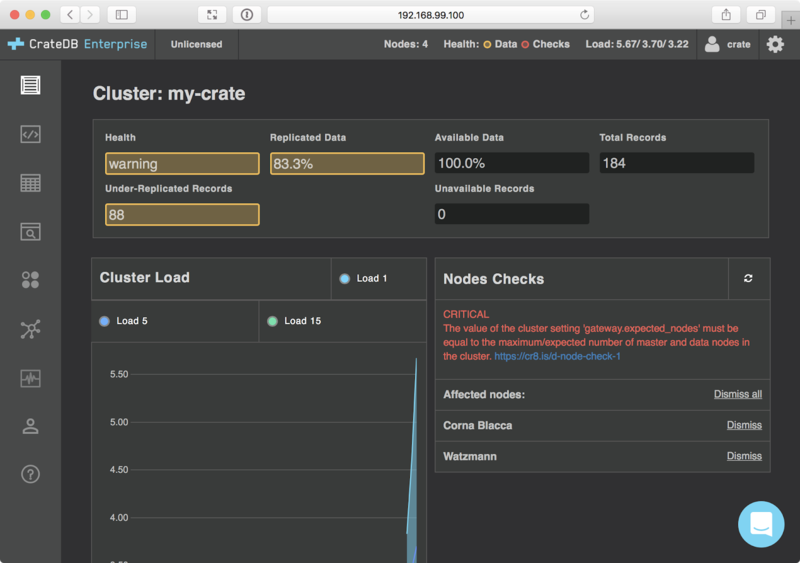 For CrateDB, there is no difference scaling in by one node and a node unexpectedly dropping out of the cluster due to failure. In both cases, a node is removed from the cluster, and CrateDB handles the rest automatically. If you haven't already imported some test data, you should do that before continuing. Leave minimum_master_nodes and recover_after_nodes as they are. Kubernetes will start making the changes to your cluster. Changes are always made to pods one by one. Depending on which specific CrateDB pod responds to your browser requests, you may see some different things as Kubernetes makes its changes. While the cluster configuration is half rolled out (i.e., in an inconsistent state), you will see some checks fail. Great! The scale in operation was a success. 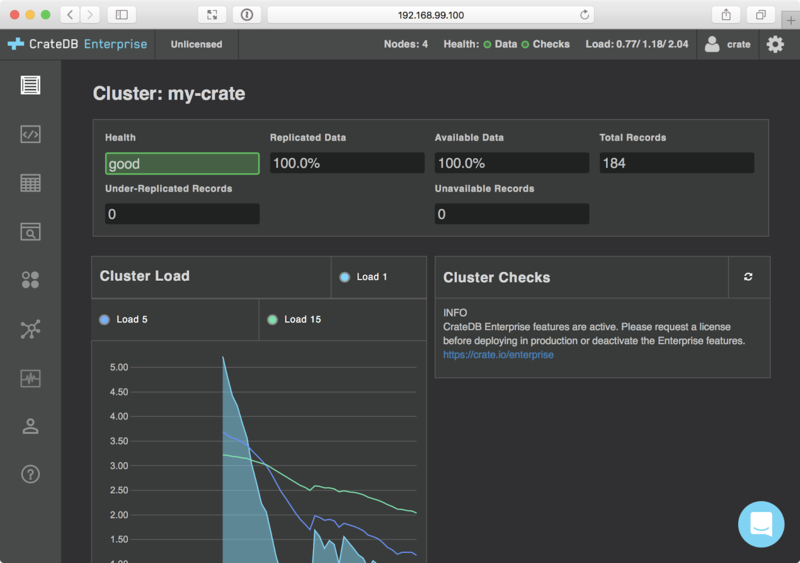 In this post, we built upon the work we did to create a simple CrateDB cluster on Kubernetes in part one of this miniseries. First, we configured persistent storage, so that CrateDB data can survive a power cycle. With this in place, we scaled out CrateDB cluster out to five nodes. Then, we scaled it back in by one node and saw how CrateDB recovers from node loss.